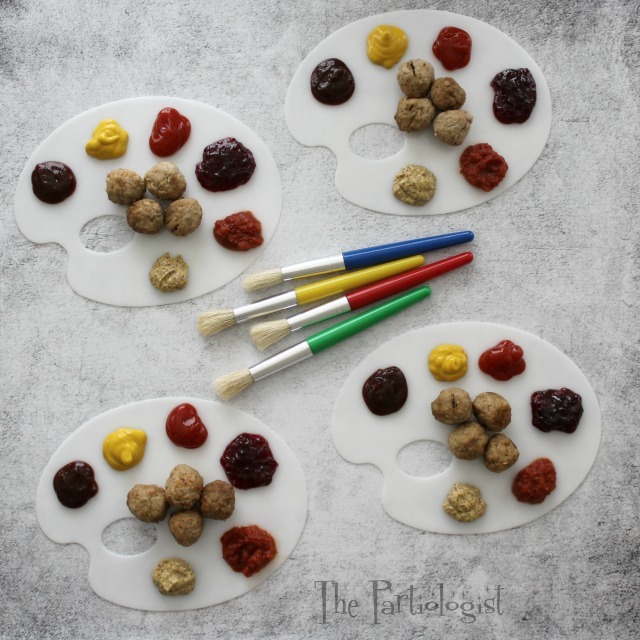 The Partiologist: Farm Rich Paint Palette Meatballs! Farm Rich Paint Palette Meatballs! Stop! Don't click away, it's me...I'm just not posting a dessert today. 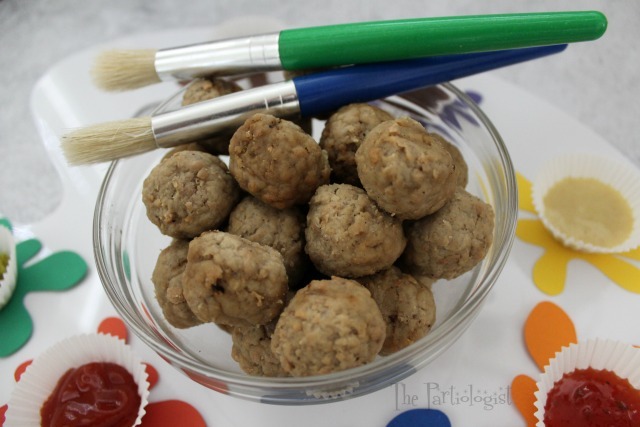 I'm featuring a super fun and simple idea using Farm Rich Meatballs. After working on this post, it made me realize how any savory food can be fun too. I have to say, my family might be thrilled if I start to incorporate something they could eat for dinner besides dessert. And with the ease of popping the Farm Rich Meatballs in the microwave to heat, I just may be on to something! 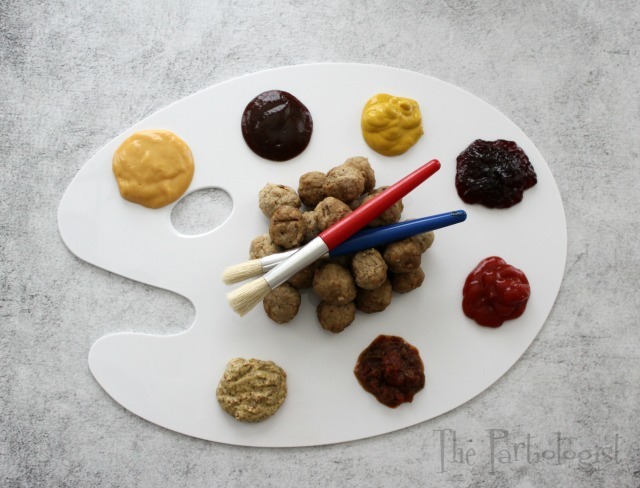 The paint palette Meatballs will bring out the artist in every kid, young and old! Who knew art could be so easy? With the help of Farm Rich, you'll be an artist in no time! 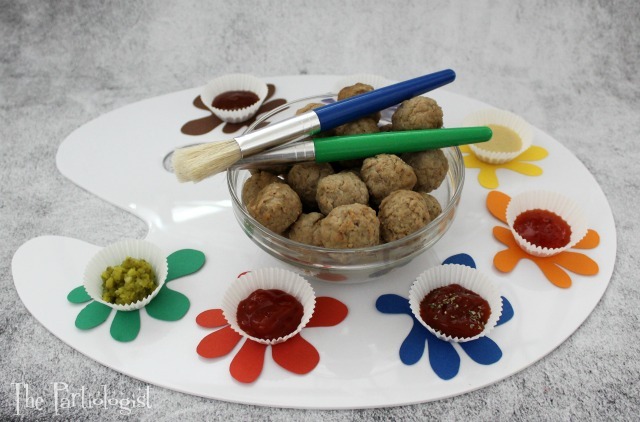 Place the Farm Rich Meatballs in the center, then top the paint palette with all kinds of splatters of condiments. Use whatever you have on hand. Or maybe it's the time to get your child to try something new? The fun doesn't stop here, I'll soon be attending a Fun Food Blogger Retreat, sponsored by Farm Rich, where five food bloggers will get to share their very own fun food ideas using many of the Farm Rich Products, provided by Farm Rich. Each of the bloggers have already been creating Back to School Snacks using Farm Rich products and soon we'll be sharing those ideas with each other. I love how simple each snack is, you'll love making them with your child! Be sure to stop by each of the blogs to check out their fun back to school snacks. Before you go, let me show you how I put together the Meatball paint palette. The Meatballs were ready in no time at all. I cut splatters of paint to place on the palette. Then I filled small paper baking cups with the sauces. Colored splatters and the brushes to use, along with the acrylic paint palette. And the Farm Rich Meatballs that made it all happen! 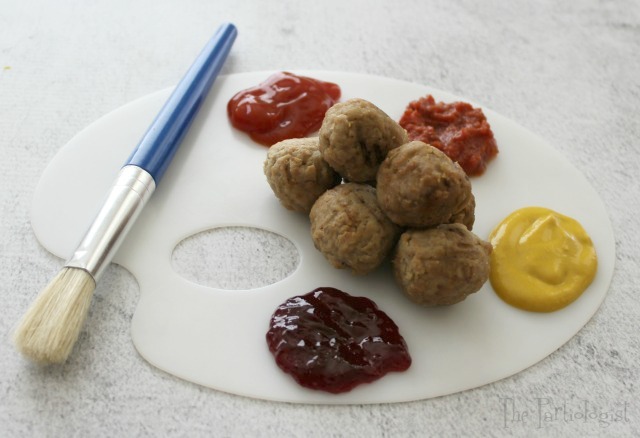 A true artist's palette, just spoon out the sauces and fill the center with the Meatballs. Seriously, so much fun the kids as well as the adults, will want to try them all! Just go to the fridge and grab a few favorites. 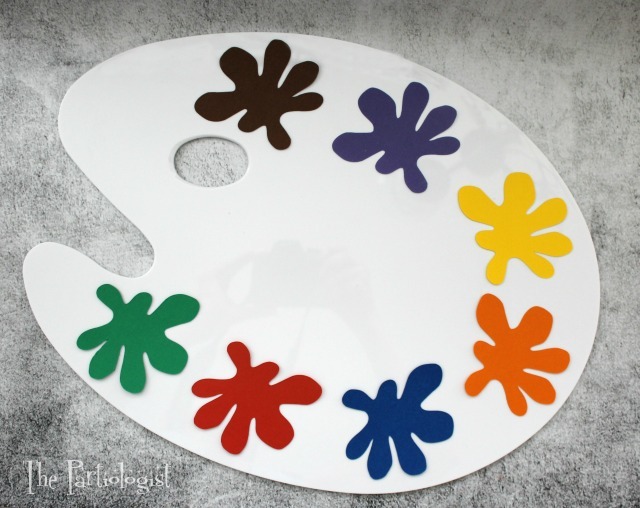 You could use a large paint palette for serving or individual paint palettes, perfect for each child to have their own. I can see it now, a back to school party serving Farm Rich Meatballs and sauces. 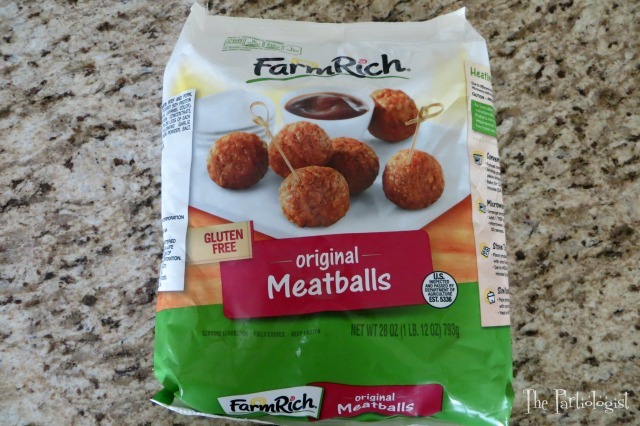 Get a bag of Farm Rich original Meatballs. You'll find them in the freezer section, along with several other Farm Rich products. They are pre cooked and ready to go, just heat and serve. And of course, the heat and serve Farm Rich Meatballs! Any way you serve them, they will be loved. What a fun after school snack, or make it a meal! 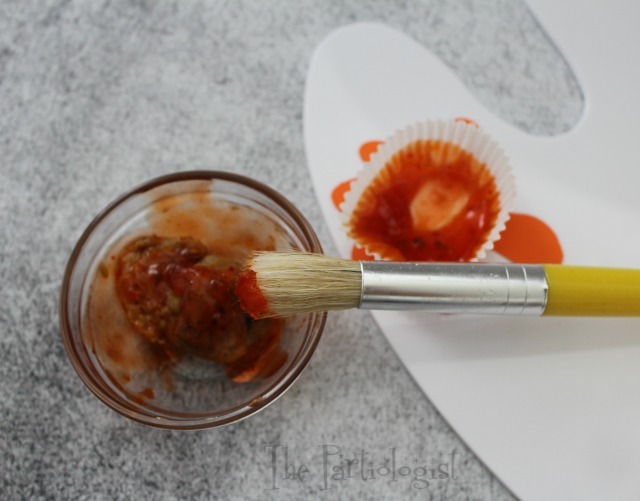 Here, I painted the Meatball with the sweet and sour sauce. 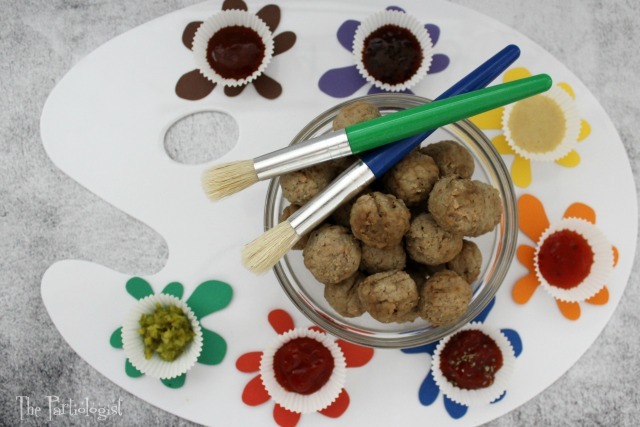 If you're hosting a back to school party, the paint palette meatballs would be the perfect way to start the party. Place a paint palette at each place setting, then add all the sauces. A few minutes before the children arrive, pop the Meatballs into the microwave and heat. 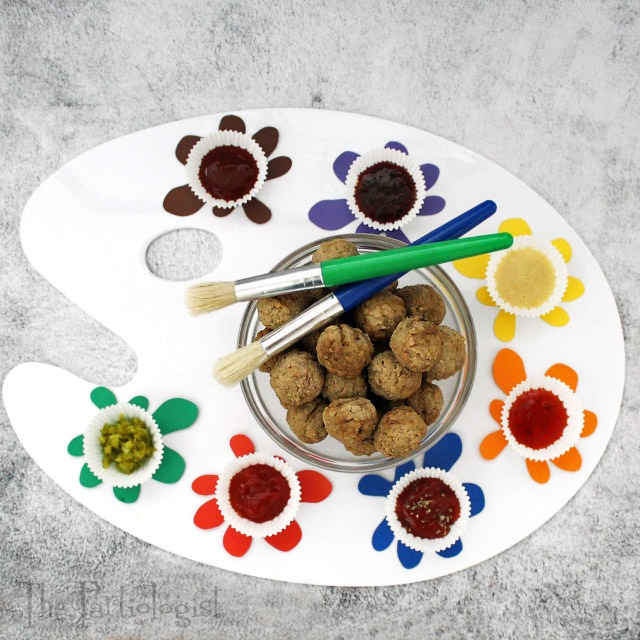 Place the Meatballs in the center of the paint palette and call the children over. Watch their eyes light up and their tummy's fill up while they gobble the Meatballs! My family loved trying the Meatballs with all the different sauces, each one became a favorite. You will be surprised how fast the kids will want to become artists! At Farm Rich, they want to offer tips/hacks, recipes, and great tasting food that help simplify everyday life – what they like to call "Real-Life Good." Farm Rich is a sponsor of the Fun Food Blogger Retreat and has also provided me with free products to use in order to create this fun back to school snack. All opinions expressed here are my own. It's a Sweet Treat in a Savory Way! love these owls! and what a fun weekend, so jealous you'll be with all my favs creating together!! can't wait to see what you come up with! Thank you Michelle, I have to agree, those owls are darling! Thank you, it's so much fun to serve this way!